Debt recovery letter templates to assist you in good credit control. A full and final settlement of a debt offer letter template. Our Deed of Assignment of a Judgment Debt for use when assigning the benefit of a court judgment debt. Our Deed of Assignment of Debt for assigning the right to recover a debt. A final demand for payment letter to issue before commencing formal legal action. A first reminder letter to send when an invoice becomes overdue. Our Late Payment Letter template for reminding a customer that their payment is overdue. Our Notice of Assignment of a Debt for sending to a debtor after a debt assignment. We offer a range of individual letter templates designed to facilitate an effective credit control system. The range of letters cover each key stage in communicating with a customer or client that has an invoice overdue. The letters address the need to actively chase up late payments whilst also keeping a good rapport with the customer. It is common for businesses big and small to allow their account to become overdue. In most instances maintaining a procedure where you do not delay in reminding a customer will ensure that your invoices get paid promptly. Our template are created in Word format and can be used as many times as required once purchased. 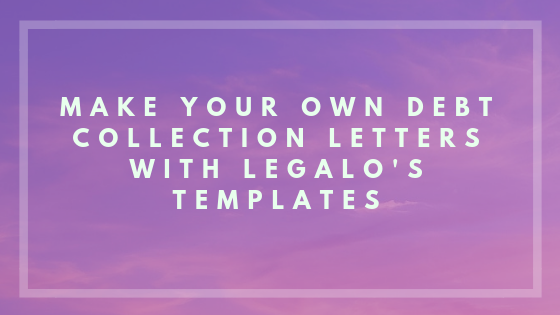 You can view a sample of the templates by clicking the ‘preview’ button on the individual letter pages. All of our templates come with a full satisfaction guarantee. The letters have been drafted by an experienced commercial lawyer, our in-house lawyer and co-founder of this website Stephen. This means you get piece of mind in knowing that they have been prepared by an expert. Under the Late Payment of Commercial Debt Regulations 2013 interest can be claimed on all overdue accounts. In our templates we do not mention this in the first later or second letter templates. It is referred to in the third letter – the final demand letter template which you would issue before issuing a claim for legal debt collection. The reason for this is that most overdue payments are an oversight or part of a practice of paying a little late on all accounts to facilitate cash flow. Customers often respond badly to overly aggressive payment recovery approaches in the early stages of a late payment. For this reason we do not recommend referencing your legal right to claim interest on the overdue amount until this last stage.